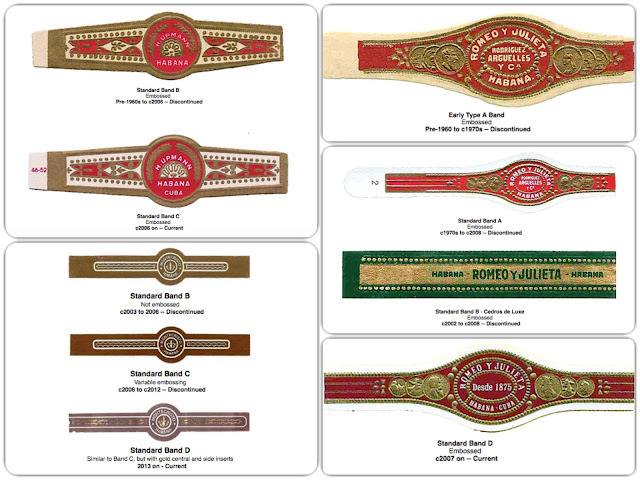 Have you noticed that cigar bands changed throughout the years? Wondered how it all started? As often as we light up our favorite premium cigars, how many times do we take the time to marvel at the lovely piece of art wrapped around the stick? The band, though small, is a signature piece that gives the premium cigar an extra special touch. It is more than just a practical place to hold the cigar; it is an exclusive calling card for all to see. The true iconic images of the cigar industry like the crest of the Romeo y Julieta, the medals of the H. Upmann and the fleur-de-lis of the Montecristo are all recognisable trademarks that can be found on your favorite bands. Legends surround the origins of cigar bands. One story tells us that the Russian empress Catherine the Great required that her cigars be wrapped in silk in order to not stain her fingers. Another tale says that cigar bands were created in London, to prevent English gentlemen from staining their white gloves. These stories are steeped in myth, and may not be 100% correct, but they certainly add to the lore of premium cigars. The real history of the cigar band began in the mid-19th century with a Dutchman living in Cuba by the name of Gustave Bock. A cigar-maker by trade, Bock came up with an ingenious way to differentiate his cigars from competitors: putting a paper band with his signature on every one of his cigars. The trend caught on quite quickly and by 1855, most manufacturers were engaging in this practice. Cigar bands came to be synonymous with prestige and artisanal-quality. 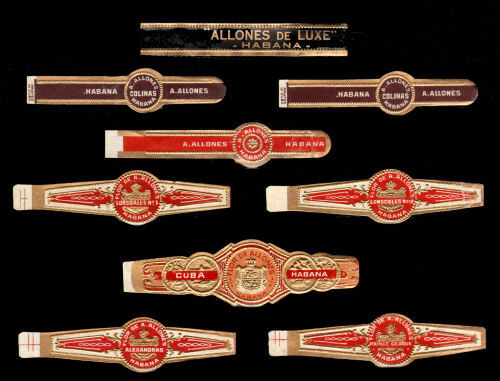 Brands began to represent their cigar’s accolades in the form of medals adorning the cigar bands. Crests and cloaks signifying regality and high class standings garnished bands as well. Brands like Montecristo used their cigar band to tell a unique story. The fleur-de-lis on its band is the French symbol traditionally representing the regal and artistic. The insignia also pays tribute to Alexandre Dumas’ novel: “The Count of Monte Cristo” the cigar’s namesake, a story of romance, revenge and intrigue in 19th century France. The application of cigar bands, a practice that has hardly changed since the late 19th century, is a process that takes precision and skill; much like the rolling of the cigars themselves. Bands are placed on each cigar at the same height and carefully hand-fastened around the wrapper. The advent of printing technology would create a revolution in cigar bands. More complex procedures like embossing and brass gilding were implemented to give the bands a more premium feel. In 1879, Heppenheimer & Maurer, a lithographing business, employed 22 full-time artists that focused solely on the creation of unique cigar packaging. Ornate designs on the bands, boxes and ads became the norm. Special edition brands like the Romeo y Julieta Aniversario were commemorated with ornate art on the bands. This era, commonly known as the Golden Age, lasted from approximately 1878 to 1915. Though the Golden Age of cigar art came to an end, cigar bands are still sought-after items. Bands became collector’s items that enthusiasts would save and preserve. To this day, there are groups of cigar band collectors; the International Label, Seal and Cigar Band Society is one such organization. The Guinness Book of World Records recognizes Joe Hruby as having the largest collection of bands at over 221,000 varieties in 1999. Today, bands remain a crucial part of the premium cigar experience. Their varied history and development make for another fascinating story to tell as you light up that next stogie. Enjoy and keep those ashes long!